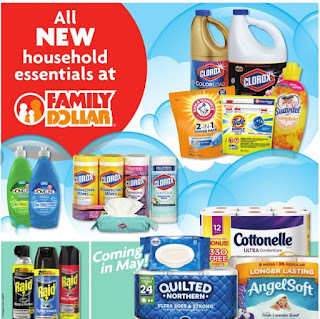 Family Dollar Weekly Ad April 4/8/2018 - 4/14/2018 - In Cover Family Dollar ad, you can find All new household essentials like Clorox, Raid, Quilted northren, Angel soft, tide simply and much more. Also find on page 2 Pepsi Products 3 FOR $10.00 PRICE DROP!, Doritos 2 FOR $5.00 PRICE DROP!, Dr Pepper or Canada Dry Products 3 FOR $3.00 PRICE DROP!, Simply Orange Juice 52 oz. or Bar S Bacon 12 oz. $3.00 PRICE DROP!, Malt-O-Meal Bagged Cereal 2 FOR $6.00 PRICE DROP!, Dinty Moore Beef Stew 20 oz., Hormel Hash 14 oz. or Spam 12 oz. $2.00 PRICE DROP! Quest Water $2.50 PRICE DROP!, Family Pet Meaty Cuts, Crunch 'Ems or Gravy Style Dog Food FINAL PRICE $5.95 With $1 Smart Coupon, Pedigree, Gravy Train or Kibbles 'n Bits Dog Food $17.50 PRICE DROP! Xtra Liquid 175-192 oz., Bonus Size or Arm & Hammer Power Paks 24-32 ct. $4.95 PRICE DROP! Oxi Clean Liquid 40 oz. 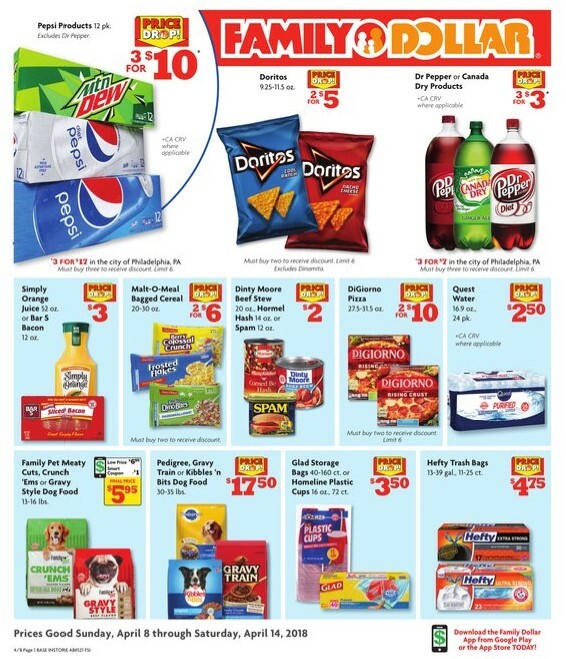 or Laundry Paks 18 ct. $0.95 with $3 Smart coupon PRICE DROP! Febreze Air Effects 8.8 oz. or Car Vent Clip 1 ct. 2 FOR FINAL PRICE $4.00 with $1 Smart Coupon* PRICE DROP! Ajax Powder Cleanser 28 oz. or Dish Liquid 12.6 oz. 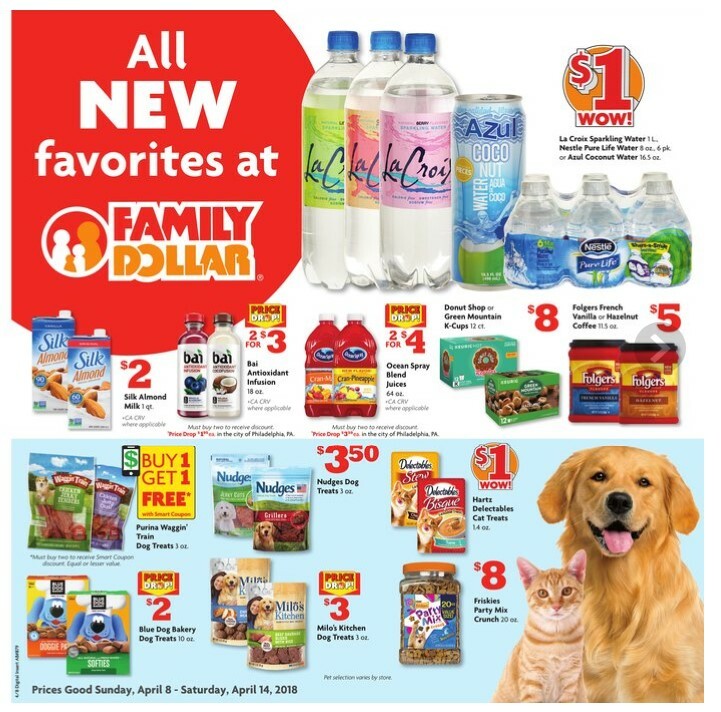 FINAL PRICE $0.75 with 25¢ Smart Coupon PRICE DROP! 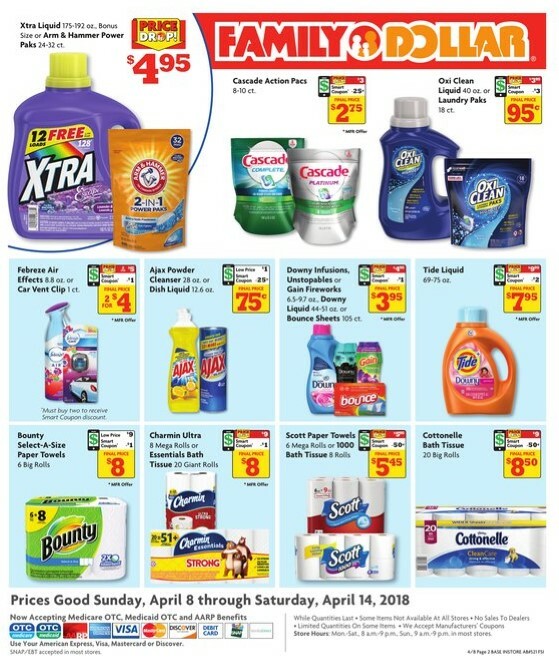 Tide Liquid FINAL PRICE $7.95 with $2 Smart Coupon* PRICE DROP! Bounty Select-A-Size Paper Towels FINAL PRICE $8.00 with $1 Smart Coupon* PRICE DROP! Scott Paper Towels 6 Mega Rolls or 1000 Bath Tissue 8 Rolls FINAL PRICE $5.45 with 50¢ Smart Coupon PRICE DROP! 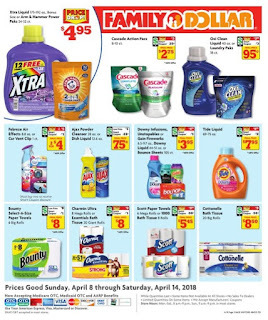 Cascade Action Pacs FINAL PRICE $2.75 with 25¢ smart coupon, Oxi Clean Liquid 40 oz. or Laundry Paks 18 ct. $0.95 with $3 Smart coupon PRICE DROP!